This meticulously researched book, rendered in a haunting, lyrical style, juxtaposes a set of cases in which vanishing vernaculars inspired the linguistic strategies of literary modernism in the early twentieth century. 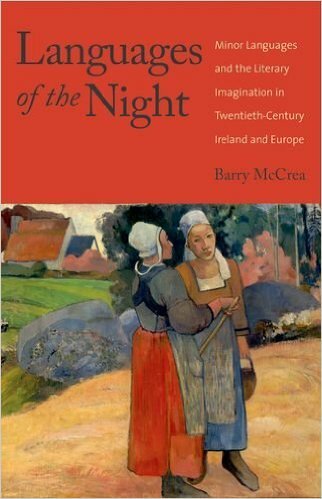 On the basis of linguistic exegesis and close readings, Barry McCrea uncovers the longings of lost language inscribed in the poetry and prose of such modernists as Seán Ó Ríordáin, Pier Paolo Pasolini, Marcel Proust, and James Joyce. In so doing, he illuminates the literary afterlife of languages that were disappearing at the peripheries of modern urban cultures, and for the first time, places them in comparative historical and cultural perspective. McCrea’s study eschews linguistic-anthropological analyses or language politics that might distinguish between the rise of highbrow literature in Irish (as language revival) and the selective use of non-standard language in Joyce, Proust, and Pasolini (as dialect writing). Instead he demonstrates, brilliantly, that these phenomena were motivated by a shared impulse to find beauty in vanishing vernaculars. An affirmation of the passion and moment of the local in the metropolitan, this comparatively slim volume will have large consequences for future research in comparative literature. It is beautifully written, imaginatively conceived, and methodologically a tour de force.